Did you know that Christianity flourished in Ethiopia many hundreds of years before it reached Scandinavia? Christianity became the state religion in Ethiopia in 330 AD, five hundred years before the first missionaries reached Denmark in the Viking Age. We, here in Northern Europe, pride ourselves on our long history and our thousand-year-old churches, but we might be suitably impressed, if we made the effort to explore the marvels that is Christian Ethiopian architecture and iconography. We recently received the little icon that is the subject of today’s blog post. It was collected in Ethiopia around 1960 by a naval Lieutenant Commander. What I love about it is that it is an example of the drastically different aesthetics, which characterises Ethiopian Christian art. Here we are not dealing with a style that is inspired by the art of European churches; instead, it developed simultaneously as a thing in its own right. 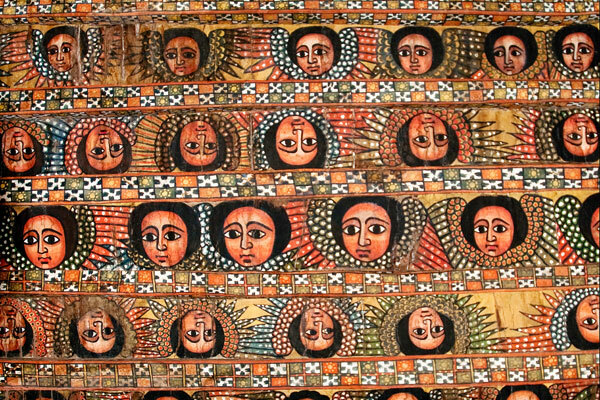 A quick Google search will show you hundreds of photos of Ethiopian Christian art. Instead of fat pale cherubs adorning the ceilings of churches, you have hundreds of brown faces with big almond shaped eyes, round black afros, and colourful angel wings peering down on you. And instead of the towering spires and glass mosaics of many European churches, you have massive Medieval structures, hewn from solid rock. The history of Christianity in Ethiopia is long and fascinating, and before it became Christian, Ethiopia had a millennium of Jewish presence. 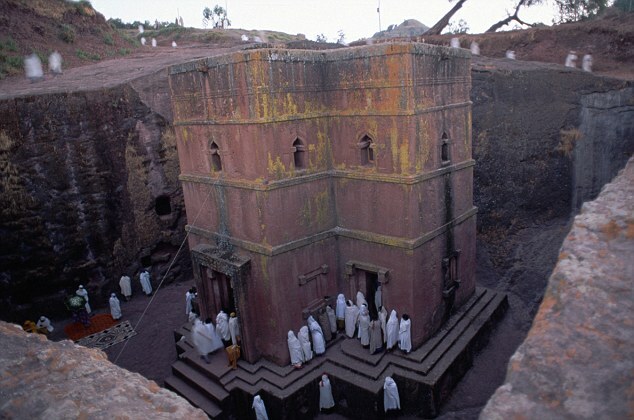 The Ethiopian Orthodox Church even claim to have in their possession the real Ark of the Covenant, hidden away in a small chapel, to be seen only by one chosen monk, who cannot leave the compound as long as he lives. There is no denying the beauty and unique characteristics of Ethiopian Christian art and architecture. Whether they possess the Ark of the Covenant, is another matter. But I for one am happy that this little icon spurred my interest in Christianity in Ethiopia and helped me to look upon the history of Christianity in a wider perspective.